Ottawa — A parliamentary report calling for greater review of Canada’s national security activities in order to protect Canadians’ rights and freedoms is a step in the right direction, even if much more must be done, says the International Civil Liberties Monitoring Group (ICLMG). “The ball is now in the Canadian government’s court,” said Tim McSorley, national coordinator of the ICLMG. 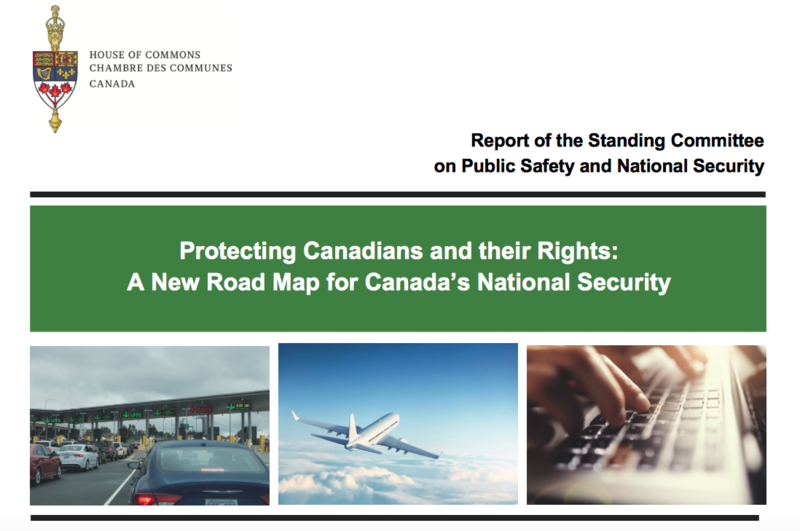 On Tuesday, the Standing Committee on Public Safety and National Security (SECU) issued their anticipated report on Canada’s national security framework. The ICLMG supports the SECU committee’s call for a much-needed review body for the Canada Border Services Agency, for the removal of the vague and overly-broad term “terrorism offences in general”, and for an integrated national security review body that will coordinate existing bodies and provide review of all other departments involved in national security activities. For a decade, the ICLMG has advocated for the implementation of Justice Dennis O’Connor’s recommendation at the close of the Arar Inquiry for such an independent, national security review mechanism. The ICLMG testified to the committee and submitted a brief arguing that while the Liberal government’s proposed committee of parliamentarians (Bill C-22) is a first step to ensure national security oversight, more needed to be done. The coalition was pleased to see its brief cited to that effect in the committee’s final report. It is important to note, though, that Bill C-22 has not yet passed, and to be effective will still need important changes. This includes removing the government’s ability to block committee members’ access to important information or to outright limit the committee’s work based on national security concerns. The ICLMG is disappointed the SECU committee’s majority report ignored the overwhelming calls by experts and the general public – cited by the NDP in their supplementary opinion – for the complete repeal of the Anti-Terrorism Act of 2015 (Bill C-51), a dangerous and unnecessary piece of legislation. The coalition is also concerned that the report contributes to legitimizing and solidifying the government’s continued use of secret evidence in criminal, immigration and national security proceedings. The committee’s solution is to extend the fundamentally flawed “special advocate” system from the security certificate regime to criminal courts and no fly list reviews. Such advocates, while tasked with protecting the interests of defendants, do not act in their defense, and cannot share evidence with the individuals in question, which tremendously affects their capacity to defend themselves in court. Regarding Canada’s “no fly list,” the coalition reiterated that reforms will not fix this flawed program, and that instead it must be repealed. Canada has clear laws that could be used to prevent a person suspected of criminal activity from boarding a flight. The use of a secret list to limit access to travel is a violation of due process and a violation of mobility rights. Finally, the ICLMG is perplexed at the recommendation that Public Safety Minister Ralph Goodale should review the ministerial directives allowing the use of information that may have been obtained through torture (the “torture memos”) since Minister Goodale has been reviewing the directives for more than a year, after calling them “troubling” in January 2016. The coalition therefore calls for the immediate removal of the directives that create a market for torture-tainted information and violate international human rights law. This entry was posted in News from ICLMG on 3 May 2017 by ICLMG CSILC.